The Obama-Trump bull market on Wall Street is now the second strongest ever. 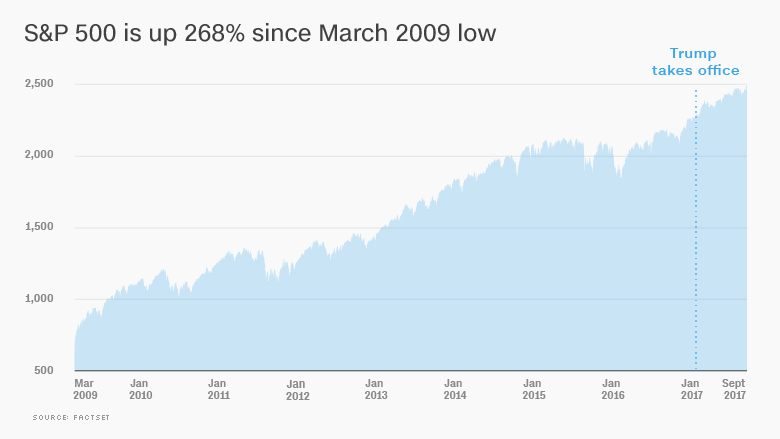 The S&P 500 has soared 268% since bottoming in March 2009 during the depths of the Great Recession. That narrowly eclipses the gains generated by the 1949-1956 bull run, according to data compiled by Bespoke Investment Group. 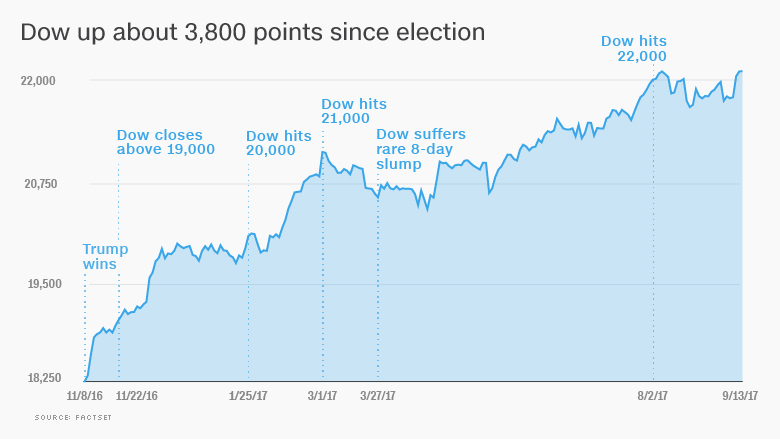 The milestone, hit on Monday after stocks raced to new record highs, reflects the slow but steady economic recovery the U.S. has been experiencing. While growth has been weaker than many hoped, it’s been consistent enough to keep the market from either collapsing or overheating. Even before this week, the bull run had the bragging rights for being the second-longest in history, spanning more than eight years. “The strength and length of the bull market reflects how awful the bear market was,” said Ed Yardeni, president of investment advisory Yardeni Research. The S&P 500 crashed by nearly 60% during the financial meltdown of 2007-2009 as millions of Americans lost their jobs and the financial system came into doubt. “People were pricing in financial Armageddon,” said Yardeni. The vast majority of the bull market’s gains occurred under President Obama, who presided over a stock market that more than tripled during his eight years in office. But the bull market has kicked into high-gear in the Trump era. The S&P 500 has gained an incredible $ 2 trillion in value since President Trump’s election, according to Howard Silverblatt of S&P Dow Jones Indices. Wall Street’s post-election party was initially driven by hopes of tax cuts and deregulation, but it’s since been supported by stronger economic growth and corporate earnings, both at home and overseas. Those who were brave enough to bet on America during the dark days of the last downturn have been rewarded handsomely. If you invested $ 10,000 in the S&P 500 when it bottomed on March 9, 2009, it would be worth nearly $ 37,000 today. Even though Trump frequently brags about stock market records, many Americans can’t feel the market boom. Only 54% of Americans have money invested in the market, either through individual stocks, mutual funds or retirement plans like 401(k), according to Gallup. That’s down from 65% before the Great Recession, meaning many people missed out of the bull market. 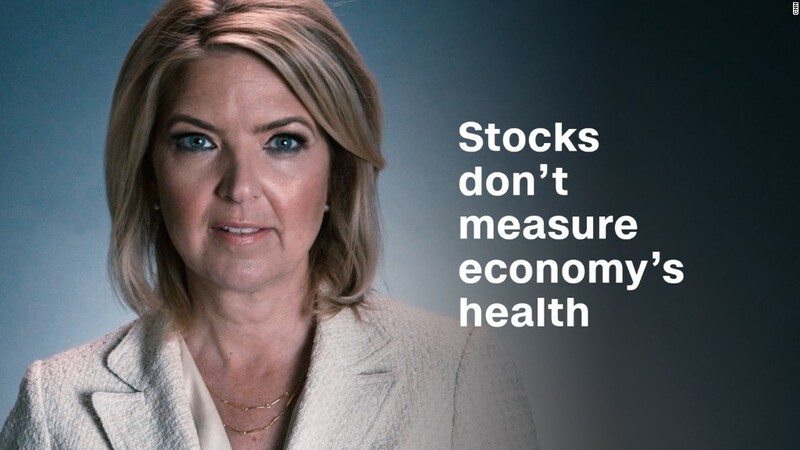 Of course, some think the stock market has gone too far, too fast. They note that much of Trump’s economic agenda, most notably tax cuts, has yet to be fully implemented. And Wall Street has paid little attention to potential downsides of the agenda, such as the threat of a trade war. Hedge fund billionaire Julian Robertson warned this week that a “bubble” is being inflated by extremely low interest rates from the Federal Reserve and foreign central banks. Ryan Detrick, senior market strategist at LPL Financial, doesn’t buy the bubble talk. “We simply aren’t seeing any of the type of excitement or over-the-top sentiment we tend to see at major market peaks,” he said. In any case, the stock market has a long way to go before it overtakes the best bull run ever — the boom of 1987-2000. Keep in mind, that boom started during the end of the Cold War and was later carried by the internet revolution. The S&P 500 would have to more than double its gains to surpass the 582.15% surge experienced during that bull market. And it would need to keep going for almost four more years to take the title of the longest in history. “That’s asking for a lot — but I wouldn’t rule it out,” said Yardeni.